Amanita Designs has released a teaser trailer for its next game. 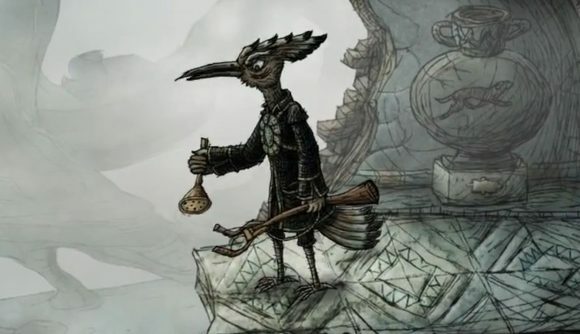 Creaks is a side-scrolling puzzle game with some surreal, gothic themes. Most recently, you may have come across Amanita Designs thanks to Chuchel. Their most recent release was a wacky point and click puzzle game, focused on the titular character’s attempts to earn itself a beloved cherry. While Chuchel was built around its sense of humour, Creaks makes it looks as though Amanita is heading for a significant departure. Most obviously, that comes across via the game’s aesthetic. It’s an art style that I recognise from Chuchel, but not only is it much more detailed, it’s overall much darker in tone. As you can see in the teaser trailer at the bottom of this article, you’ll play as a young man who discovers a world in the walls behind his house. As you venture into the darkness, you’ll come across a weird selection of characters, including a horn-wielding bird-person, what looks like a shadowy version of yourself, and a floating jellyfish-person. Amanita is also, however, setting Creaks apart from the rest of its catalogue in another way. Until now, all of its release have been point-and-click adventures. In a press release, the studio said that Creaks will be their “first-ever departure” from the genre. But while point-and-click may be out, it looks like ‘adventure’ will still be a central part of the game. We don’t have a precise release date for Creaks just yet, but we do know that it’ll launch in 2019. You’ll have to tide yourself over with the teaser trailer, which you can watch above.